Is it the ADHD or just bad behavior? It’s hard to know for sure, but one thing’s for certain: disciplining a child who struggles with inattention, hyperactivity, and/or impulsivity isn’t easy. It takes a lot of patience and perseverance, but with more children being diagnosed with ADHD each year, and teachers, therapists, and parents gaining more insight into what does and doesn’t work, there are heaps of fabulous ADHD parenting tips and discipline strategies you can start implementing TODAY to help curb challenging behaviors and teach your child appropriate self-control skills both at home and in the classroom. ADHD, or Attention Deficit Disorder, is a medical condition that causes disruptions in attention, self-control, and the ability to sit still. ADHD is often diagnosed in school-aged children when their symptoms interfere with their ability to focus in the classroom and complete schoolwork. ADHD is more common in boys than girls, can persist into adulthood, and can have negative consequences not only in a school setting, but also at home, in relationships, in the work force, and beyond. Inattention: Doesn’t appear to be listening, has trouble following directions, is easily distracted, etc. Keep in mind that most young children struggle with self-control and find it difficult to sit still and follow directions, and it isn’t until these symptoms begin to significantly impair a child’s life at school and at home that an ADHD diagnosis is pursued. If you suspect your child has ADHD, it’s important to consult with a trained medical practitioner as your child must display a certain number of symptoms for a specified period of time before a diagnosis can be made. Educate yourself. If you’re looking for the best ADHD parenting tips to help your child, one of the best things you can do is educate yourself about her diagnosis. The better you understand the struggles your child faces, the easier it will be to strategize ways to help her in the classroom and at home. Putting your head in the sand, pretending your child’s challenges don’t exist, and/or blaming yourself for the diagnosis isn’t going to benefit your child in any way, shape, or form. The sooner you reach a level of acceptance and equip yourself with the information you need to help your child thrive, the better. Talk with your child’s doctors and teachers, research online, join support groups, and read as much as possible. Here are a few books to help you get started! Taking Charge of ADHD, Third Edition: The Complete, Authoritative Guide for Parents. If you’re new to ADHD, this is a great book to start with as it provides science-based information about ADHD so you can better understand your child’s symptoms and ensure you receive an accurate diagnosis. It also provides great ADHD parenting tips and ideas to help your child thrive at home and at school, as well as behavior management strategies that work. Delivered from Distraction: Getting the Most out of Life with Attention Deficit Disorder. If you’re looking for information on treating ADHD through medication, as well as the other options you can try, including diet and exercise, this is a great book to invest in. It also outlines the diagnostic procedure, and provides powerful strategies for coping with the symptoms of ADHD. Parenting Children with ADHD: 10 Lessons That Medicine Cannot Teach. Another great resource, this book really helps explain ADHD to parents, and provides great tips on how to teach children self-control as well as practical advice for tackling school work, household chores, etc. The ADHD Workbook for Kids: Helping Children Gain Self-Confidence, Social Skills, and Self-Control. If you’re looking for a workbook you can use to help manage your child’s ADHD symptoms, this is the one to buy! In just 10 minutes a day, you and your child will learn strategies for tackling everyday tasks, how to stay focused, how to make and maintain friendships, etc. Create a routine and stick to it. It’s no secret that kids thrive on consistency and routine, and this is especially true for kids with ADHD. Creating a daily schedule – and sticking to it – will not only help your child feel more in control, but it will also set her up for long-term success by showing her how to stay organized and manage her time effectively. In order to reap the full benefits of implementing a daily routine, you must adhere to it all the time – even on weekends, school holidays, and summer vacation. Limit sugar and caffeine as much as possible, and avoid it completely in the afternoon and evening. Create a calming bedtime ritual. Remove electronic devices, dim the lights, and engage in low energy activities like reading and coloring. Make sure your child goes to bed and wakes up at the same time every day, even on weekends. Use sleep tools, like blackout blinds, lavender, and a weighted blanket. Allow your child ample exercise. If your child struggles with hyperactivity, make sure she gets regular exercise throughout the day to shed herself of excess energy. Hit the park before and after school, allow her to jump on a portable trampoline when she feels restless, enroll her in extracurricular activities, and provide regular active breaks when you find her struggling to focus. Break tasks down. If your child finds certain tasks overwhelming, another important ADHD parenting tip is to teach her how to break activities and assignments into smaller, more manageable tasks. Set aside time each week to review your child’s homework assignments together and find ways to make them less overwhelming. Write out what she needs to do (and when) in order to meet her deadlines so she can visually see what’s expected of her, and then work with her to ensure she completes each step along the way. Teach and encourage organization. Kids with ADHD struggle with organization, which can often get them into trouble, especially at school. They struggle to plan ahead and prioritize, and often forget to complete the tasks required of them in a timely manner. One of the best ways to help a child overcome this challenge is to put organization systems in place both at home and at school, and to enforce strict maintenance of these systems over time. Advocate for your child. Being the parent of a child with challenges like ADHD can be difficult at the best of times, and downright overwhelming at the worst, but what we fail to remember is that it’s even harder for our child. Reminding your little one that you are on her side, no matter what, and learning how to advocate for her at school and in public will not only teach her how to advocate for herself as she grows, but it will also remind her that there’s at least one person in this confusing, unforgiving world who loves her unconditionally. Develop ‘house rules’. As you’ve probably gathered from the ADHD parenting tips provided above, structure is particularly important for kids with attention deficit hyperactivity disorder. When it comes to managing a child’s behavior, developing a set of ‘House Rules’ in which you clearly define what is expected of your child can be life-changing as she’ll be more successful in meeting the goals set out for her. Keep the list somewhere visible to your child and revisit it together often, and if you find your child struggling to follow the house rules you’ve set forth, consider turning it into a reward chart whereby your child earns a small reward for successfully following a certain number of rules each day (i.e. if your child earns 4 of 6 check marks, she gets an additional 15 minutes on her iPad after school). Use positive reinforcement. Reinforcement is a fabulous technique to use when a child is demonstrating behavioral problems, and while both positive and negative forms of reinforcement can help teach children self-control, research tends to suggest that positive reinforcement – the act of rewarding a child when she completes a desired behavior as a means of increasing the likelihood she’ll repeat the behavior again – is the most effective. Sticker charts are a simple, yet effective, form of positive reinforcement that can be extremely motivating for kids, and I love this Magnetic Reward and Responsibility Chart as you can easily customize it for your individual child. Be consistent. When it comes to creating routines, setting out expectations, and enforcing rules for kids with ADHD, consistency is extremely important. This means that you must always follow through with what you say, no matter how hard it may seem in the moment, and that you and your spouse must always be on the same page when it comes to parenting and disciplining your child. When you ‘give in’ to your child, you teach her that your rules and expectations are up for negotiation, but when you put your foot down and follow through, she will soon learn to honor and respect your decisions. Criticize. Remember that the goal behind using consequences is to provide an opportunity for your child to learn from her mistakes, not lower her self-esteem. Ignore bad behavior. If your child is engaging in undesirable behavior that isn’t dangerous or harmful to herself or others, ignore it. Do not engage with her and avoid eye contact until she stops the behavior in favor of something more acceptable, at which time you should offer praise and positive interaction. Use praise and rewards. Taking the time to point out and praise or reward your child when she behaves appropriately not only boosts her self-esteem, but it also teaches her what your expectations are and makes her more motivated to seek out desirable instead of undesirable behaviors. Opt for natural and logical consequences. Natural consequences occur inevitably as a result of a child’s behaviors or actions (if your child refuses to eat, she’ll feel hungry) whereas logical consequences require thought and involvement from someone else, such as a parent, teacher, or caregiver, and are designed to help children replace poor behaviors with more appropriate choices (if your child refuses to pick up her toys after being asked, the toys are taken away for a certain period of time). While both kinds of consequences are effective, natural consequences don’t always occur as a result of poor behaviors, making logical consequences a more effective strategy to understand and implement when it comes to disciplining a child with ADHD. Of course, coming up with consequences in the heat of the moment can be challenging, but if you take the time now to anticipate your child’s behaviors and brainstorm natural and logical consequences, you will be much better equipped when disaster strikes! CLICK HERE for 13 examples of logical consequences that work. Schedule regular quality time with your child. If your child has a tendency to act out the moment you try to have a conversation with your spouse, make a phone call, respond to an email, load the dishwasher, or grab 5 uninterrupted moments to yourself, it can be extremely frustrating and cause you to raise your voice and enforce unnecessary consequences. What we fail to realize on moments like this is that our children are simply vying for our attention, and we are negatively reinforcing the behaviors they’re exhibiting. A much better option is to allocate 15+ minutes of uninterrupted quality time with each of your kids everyday so they don’t need to actively seek your attention in any way you’ll give it to them. This can be particularly effective when dealing with children who have ADHD as a lot of the interactions they have with the world around them tend to be frustrating and negative. Connecting with them in a positive manner will boost their self-esteem and self-confidence and help curb their tendency to seek out negative versus positive attention. PRO TIP: If you need to take care of something important while your child is with you, like a phone call, email, or work project, engaging in 15 minutes of one-on-one time beforehand to ensure her needs are met and she feels connected to you will go a long way in keeping distractions to a minimum when you need a little peace and quite! Be clear and concise when giving directions. If your child struggles to focus and you consistently find her dawdling when you ask her to do something, make sure you have her full attention when making requests of her. Turn off distractions, get down to her level, look her in the eye when asking her to do something, and then ask her to repeat your request back to you to ensure she heard you correctly. Remember to keep directions short and sweet, and to break them down into manageable tasks that won’t overwhelm your child. Instead of saying, ‘please get dressed for school’, say, ‘please go put your tee-shirt and shorts on.’ By keeping your requests as specific as possible and limiting the number of things you’re asking your child to do at once, you’re setting her up for success. Use praise. Children who have problems sitting still, struggle to pay attention, and lack self-control receive a lot of negative feedback throughout the day. Teachers and parents spend a lot of time telling these kids about all of the things they’re doing wrong, and while this isn’t always done deliberately, it can have a huge impact on a child’s feelings of self-worth. Offer praise wherever possible, and make it a point to highlight one (or more) things your child does RIGHT each day. Remember that our children ultimately want to please us in everything they do, and when we recognize their efforts – even when they don’t turn out the way they had hoped – it can have such a positive impact on their self-esteem. Remind your child to take breaks. If your child struggles to pay attention for long periods of time, identify appropriate ways for her to take breaks in different settings so she can regroup when she’s feeling frustrated, and give her reminders when you notice her starting to feel frustrated. This will help ward off aggressive explosions during activities she struggles with (hello, homework!) and over time she will learn how to recognize when she needs a break and act accordingly. Don’t sweat the small stuff. As much as we want our kids to be on their best behavior 100% of the time, this isn’t necessarily a realistic expectation, especially when you’re the parent of a child with ADHD. Instead of aiming for perfection – which no parent should do, by the way! – focus on the things your child can do and go from there. Stop sweating the small, inconsequential stuff, and focus on the big things instead. Keep your own emotions in check. When it comes to disciplining a child with ADHD, staying calm and keeping control over your emotions won’t always be easy, but it can have such a positive impact on your child’s life as well as your own emotional well-being. When you feel yourself becoming frustrated, remove yourself from the situation and allow yourself ample time to calm down to ensure you react appropriately, and be sure to make self-care a priority. Our emotional health impacts how we feel about ourselves. It also enhances the quality of our relationships, and effects how we deal with our feelings and handle difficulties. Self-care isn’t selfish – it helps us manage stress and handle things, both positive or negative, in a healthy way. If you’re the parent of a child with ADHD who struggles with attention and focus, hyperactivity, and/or self-control, I hope this collection of simple yet effective ADHD parenting tips and discipline techniques prove useful to you. 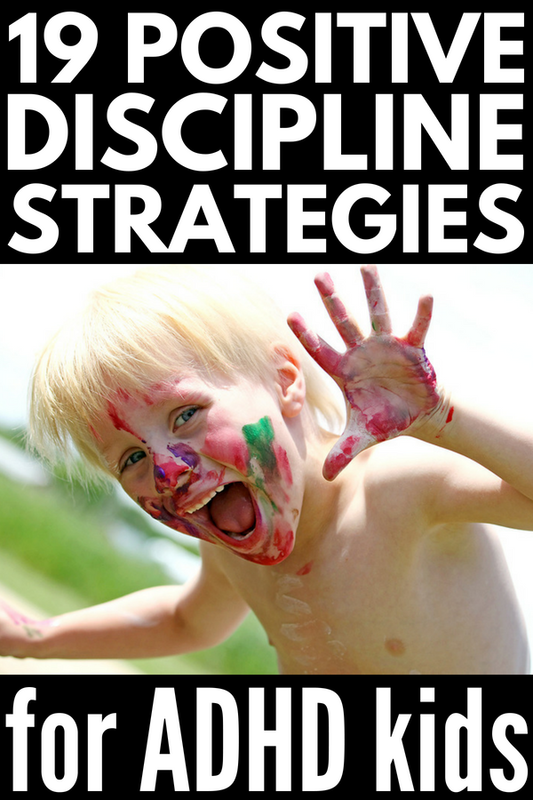 If you found these ADHD parenting tips and discipline strategies useful, please share this post on Pinterest!